Most of us find some aspect of our jobs that require us to modify our preferred behavior. Perhaps you’re more assertive at work than you really feel comfortable with or maybe you’re more ‘inclusive’. The point is that we can and do deal with the demands of the workplace by adopting a ‘work’ personality. Most of us do it fairly effortlessly. We accept that the world of work is not about living within our ‘comfort zone’ all of the time and we all have the ability to step outside of our natural behavioral preferences in order to get something done. The problem is that the way personality questionnaires are applied in the real-world takes no account of this. One argument that you may hear, is that if you try to influence the test results then you will have to operate ‘outside’ of your personality type for 40 hours a week. This is overstating the case to the point of absurdity; very few people would even consider applying for a job which was totally unsuitable for them. You do not need to fake a 180 degree change in your personality, but you may need to modify how one personality trait appears in the results of a test. This is perfectly reasonable as most of us modify our behavior at work anyway. The extent to which people behave differently at work to the way that they behave outside of work is something that does not seem to have been studied in any serious way and is something that personality tests completely fail to take into account. 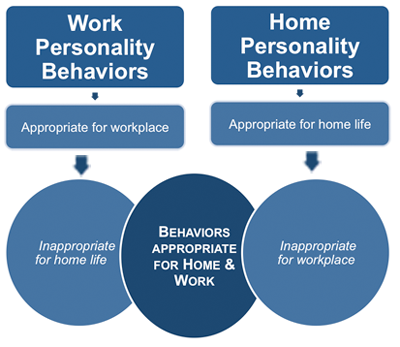 Anecdotal evidence and personal experience suggest that a significant number of people are able to behave very differently between home and the workplace. You may even have met someone who appears very laid-back socially and who defers to their spouse regarding social and domestic arrangements but who nontheless has a high powered job which involves a lot of tough decision making. In a similar vein, many people with sedentary technical jobs prefer to spend their leisure time doing something active rather than spending it in front of a computer screen. If you recognise in yourself this dichotomy between workplace and non-workplace behaviours, then you should answer all personality test questions from a workplace perspective. For example, consider the following statement. You should answer this question from a workplace perspective. In other words you may wear your heart on your sleeve at home, but if you are much more guarded at work then make this clear in your answer by selecting C or B rather than D.
If you want the job then you had better find out what it is that the employer is looking for and make sure that your personality questionnaire answers reflect it. At the very least you need to make sure that you don’t blow your chances because one trait comes over as too extreme or inappropriate. Remember, almost all of the interviewees have to be rejected. The amount of effort you need to spend on ‘engineering’ your personality questionnaire answers depends on two factors. Firstly, the organization. Some organizations have a distinct personality type that they actively try to recruit. This will usually be obvious from both their marketing material and their reputation. Any organization that promotes its people as being of a certain ‘type’ will probably be using personality questionnaires to reject anyone who doesn’t fit with the corporate image that they want to promote. This is common in management consultancies and in jobs above a certain level in big corporations. Secondly, the job. Some interviewers suffer from a very blinkered approach to what type of personality is required for particular jobs. For example, if the profile for successful salesmen indicates that extroversion is a desirable characteristic, you had better be sure that you score highly on this trait if you want the job. Whilst you don’t want to pursue jobs that you are obviously unsuited for, you need to make sure that your personality questionnaire answers won’t cause any ‘red-flags’ to appear in selection for jobs that you feel comfortable with, or where you already have a track record.